A solution to the ´Suicide of Europe´ and the human catastrophe enforced on innocent people. All the world´s governments should now actively assist in preparing for the return of the majority of the refugees, either to their own homelands, or, to living quarters set up in selected countries of similar faiths and social behaviour. 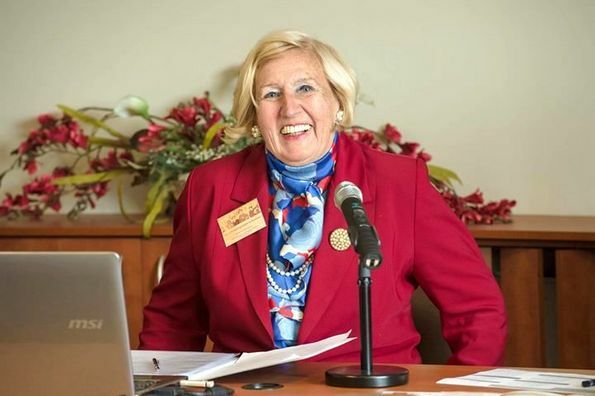 Prof. Dr. Ingrid Detter Frankopan. Author of "The Suicide of Europe"
It will not be satisfactory to create isolated living quarters without the opportunity for jobs and social facilities. Medium sized living quarters could be created as an expansion of existing cities which can offer jobs and opportunities for integration. Turkey, for example, is a large country, with hundreds of cities whicht could be used. Likewise, to a lesser extent in Libya. Should avoid mixing African refugees with those from the Middle-East region, and refugees of Muslim faith with Christians. The evil people who intentionally created the European immigration catastrophe should be taken to court, and their assets frozen to assist in the huge cost of relocating the majority of the refugees, as well as the cost of creating living quarters, with a suitable monthly cash payment towards their survival until they acquire employment and are able to fend for themselves and their families. They are furthermore also guilty of attempting to destroy the European cohesion, democracy and culture, which is also unforgivable. 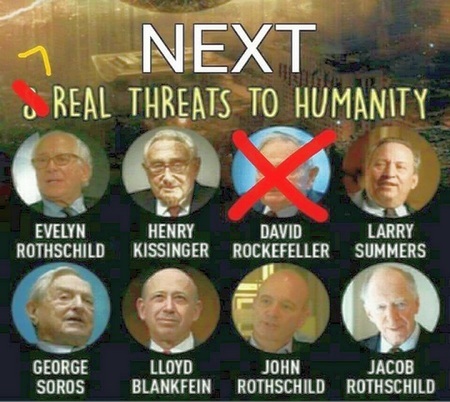 The first of the responsible persons should without a doubt be billionaire George Soros and his foundations, as well as his compatriots in the Rockefeller family. As there no doubt are good reasons why President Trump has not already accused the perpetrators, he could make suggestions to them on ´humanitarian grounds` to use their foundations to help with the cost of relocating the immigrants. If we look around us, the Kalergi plan seems to be fully realized. We face Europe’s fusion with the Third World. The plague of interracial marriage produces each year thousands of young people of mixed race: The children of Kalergi». Under the dual pressures of misinformation and humanitarian stupefaction, promoted by the MSM, the Europeans are being taught to renounce their origin, to renounce their national identity. The servants of globalization are trying to convince us that to deny our identity, is a progressive and humanitarian act, that racism is wrong because they want us all to be blind consumers. It is necessary, now more than ever, to counter the lies of the System, to awaken the revolutionary spirit of the Europeans. Everyone must see this truth, that European Integration amounts to genocide. We have no other option, the alternative is national suicide. Although the reasons due to which Kalergi made the choices he made are of no particular interest to us, we will try to answer a question that will surely our readers have already asked: Why a European aristocrat with Flemish, Polish, Greek-Byzantine roots and even with some samurai blood in his veins (from his mother) was such body plans and organ in the hands of dark forces? The reasons, in our opinion, are multiple, idiosyncratic, psychological and ... women. We therefore observe a personality with strong snobbish attitudes, arrogance, and, allow me the term, degenerate elitism. Also, the fact that his mother was Asian, perhaps created internal conflicts and frustrations, something that can happen to people with such temperament. But the most decisive factor must have been the proper teenager, which incidentally, of course, was beside him, and became his first woman (at age 13): The Jewess Ida Roland, who would later become a famous actress. 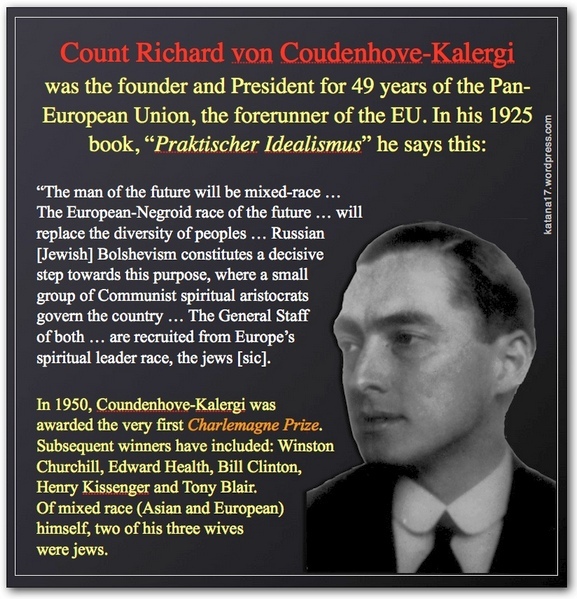 The Coudenhove-Kalergi Prize goes to President Van Rompuy On November 16th 2012, the President of the European Council, Herman Van Rompuy, was awarded the Coudenhove-Kalergi Prize, during a special conference in Vienna, to celebrate the 90 years of the pan-European movement. The prize is awarded every two years to leading personalities for their outstanding contribution to the process of European integration. The book, "Practical Idealism" was written by Count Richard N. Coudenhove Kalergi and published in Vienna 1925, and is banned in Germany.